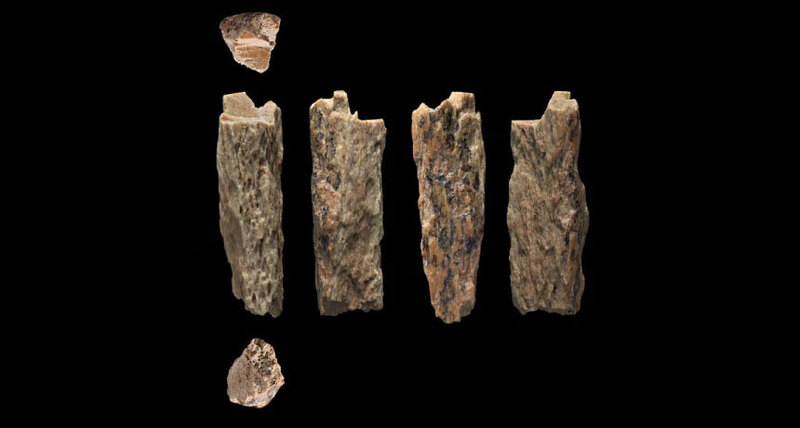 MIXED FAMILY This 50,000-year-old bone fragment (seen in multiple views) was excavated from Siberia's Denisova Cave in 2012. The bone belonged to a teenage girl who was part Neandertal and part Denisovan. Talk about blended families. A 13-year-old girl who died about 50,000 years ago was the child of a Neandertal and a Denisovan. Researchers already knew that the two extinct human cousins interbred (SN Online 3/14/16). But the girl, known as Denisova 11 from a bone fragment previously found in Siberia's Denisova Cave, is the only first-generation hybrid ever found. Genetic analyses revealed that the girl inherited 38.6 percent of her DNA and her mitochondrial DNA from a Neandertal, meaning that her mother was Neandertal. Her dad was Denisovan, and contributed 42.3 percent of the girl's DNA, Viviane Slon of the Max Planck Institute for Evolutionary Anthropology in Leipzig, Germany, and colleagues report online August 22 in Nature. The girl's father had Neandertal ancestry, too, but way back in his lineage, about 300 to 600 generations before his birth. Although the girl's remains were found in Siberia, her Neandertal DNA more closely matches a western European Neandertal from Vindija Cave in Croatia - thousands of kilometers to the west - than an older Neandertal from the same cave as the girl. That finding may mean that eastern Neandertals spread into western Europe sometime after 90,000 years ago, or that western Neandertals beat them to the punch, invading eastward into Siberia before 90,000 years ago and partially replacing the Neandertals living there. Researchers need to test more DNA from western European Neandertals to determine which scenario is correct.